TheEnvironmental Protection Agencyaccidentally released 3 million gallons of toxic wastewater from an abandoned mine at Silverton, Colo., into the Animas River, yellowing it all the way to New Mexico, "meaning about six Olympic-size swimming pools of wastewater came downstream" in "the region's most important waterway," Chase Olivarius-Mcallister, Mary Shinn and Shane Benjamin report for The Durango Herald. The EPA's latest estimate of the size of the spill is three times what the agency first estimated. The Animas is a popular kayaking stream. 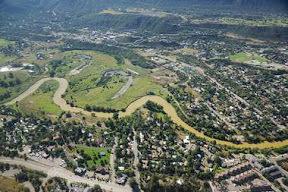 EPA estimated Sunday that lead and arsenic levels in the river through Durango were up to 3,500 and 300 times the normal levels, respectively. "Officials said those levels have dropped significantly since the plume moved through the area,"report Steve Garrison and Joshua Kellogg of The Daily Times in Farmington, N.M. "The mine continues to discharge 500 gallons per minute, EPA Region 8 administrator Shaun McGrath said in a teleconference call Sunday afternoon, but the polluted water is being contained and treated in two ponds by the site of the spill." "The EPA confirmed it is seriously considering declaring parts of Silverton a Superfund site," the Herald reports. "For two decades, the town of Silverton has resisted the EPA’s attempts to make parts of its mining basin Superfund sites—though U.S. Geological Survey scientists have said the heavy metals flowing out of its mines and into the Animas River constitute the worst untreated mine drainage in the state—arguing the designation would hurt the town’s reputation. . . . Russell Begaye, president of the Navajo Nation, said Sunday he plans to file a lawsuit against the EPA as a result of damages to the nation’s water supply." EPA said it expects no lasting effect to human health. 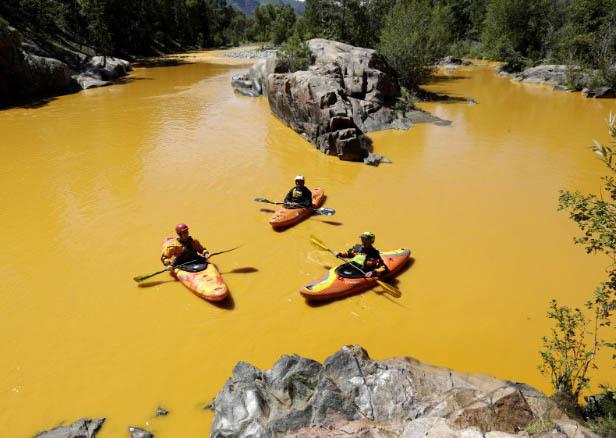 "EPA and the New Mexico Environment Department said they will test private domestic wells near the Animas to identify metals of concern from the spill," CNNreports.